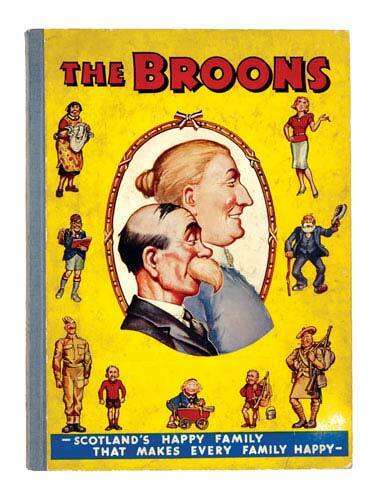 BROONS BOOK 2 (1942) £3,010.00 - MAW AN' PAW PROUD! 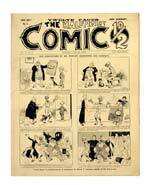 A few early issues of the Broons and Oor Wullie books were initially published with hard "annual" style boards and are much rarer than the soft covers that were generally distributed. This example with hard boards was contested to £3,010 and is one of only four we are aware of, the last one selling in our September 2004 auction for £3,355, also hard bound in the same vg+ grade. 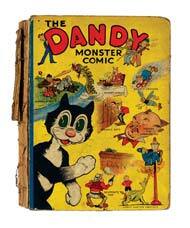 Our Dandy Monster Comic No 1 was in pretty poor condition with detached front board and no spine. Found behind a casement wall by two builders demolishing a house, this spineless Monster was hotly contested to £418, the winning bidder waiting with cow gum and tweezers to breath some life back into its battered boards. (The other end of the spectrum was our vfn copy from September's catalogue, the highest grade in existence, it reached a record £6,230). The Beano Comic No 1 was also of lower grade but there is always a great swathe of potential owners on our database and in Internet Land who would like to have this kingpin No 1 as the pride of their collection. In gd grade with a small hole in the front cover, £2,222 took away this slightly flawed gem, its new owner also snaffling some war years Beanos along the way. 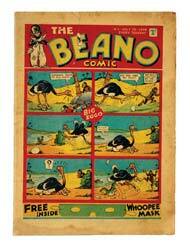 We reckon there are about seventeen or eighteen copies each of Beano and Dandy comic first issues now known to exist. 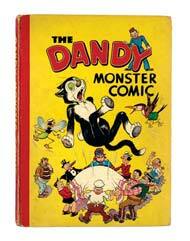 The third Dandy annual of 1941 is one of the most difficult to locate and this reflected in the winning bid of £853 tendered for this generally worn gd+ copy. 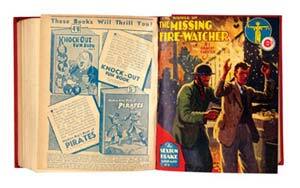 The 1947 annual with Korky tossed in a blanket cover is easier to find, but this vg copy doubled its lower estimate to £247, the winning bidder absolutely thrilled with his purchase as it completed his run of early Dandy annuals, fifteen years in the making. Boiled sweeties all round, but don't get left with the green one! The market in Rupert annuals is variable at the present time with prices for even the finest copies difficult to predict. 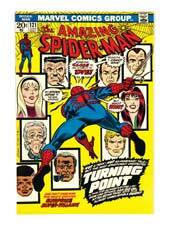 This was borne out by our selection of three Magic Painting issues from 1960, 1961 and 1962. Always collectable with the painting pages untouched, our three issues were in Near Mint grade with no discernable defects. The 1960 made £230, the 1961: £184 and the '62 a whopping £365, a probable record. By contrast late 1940s examples in mid grade with cover markings were taken at just over £30 each and 1953-55, all in vfn condition, raised between £120-145 each. 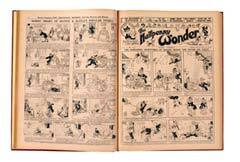 Our vendors with turn of the century comics got their ha'pence worth with £99 securing the 1898 Halfpenny Comic No 1 and £300 a bound volume of Halfpenny Wonder comprising issues 1-40 (1914). Our bound volume collection continues to find successful and determined bidders with Butterfly, Firefly, Chuckles, Little Sparks, Merry And Bright, Rainbow and Boy's Herald all selling in the £150 -220 range. Please check our Prices Realised section for precise details. The high flyer in our male-dominated bound volume collection was, of course, a girl (wasn't it ever thus?). Girls comics have a dedicated and loyal following in the UK and there are also some major collectors in Australia and New Zealand who always feature strongly in the bidding. Just such a tussle erupted over lot 28 where a Schoolgirls' Own run featuring issues 49-100 in two bound volumes was taken to £440, nearly £9 a copy. Even the Library version of this title reached £275, comprising as it did issues 1-13 and 26-49. The fact is the old girls just aren't out there, their hockey sticks long abandoned in rusty PE lockers. 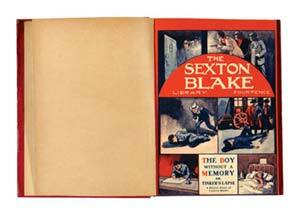 It would take a pretty smart detective to keep finding them and Sexton Blake could be just the chap. No longer a poor man's Sherlock Holmes this trusty sleuth has no trouble unearthing willing bidders and five of his bound volumes from 1928-29, numbered 84-99 and 152-155, were snapped up for £385. 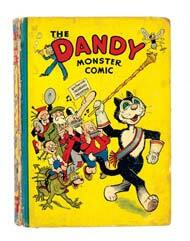 This figure was only surpassed by 36 issues from his second series in 1940-42 solving the crime for £423. No trick of the light, Dr Trenchard. We offered a rare run of Hotspur and Rover war years bound volumes and although war shortages led to issues appearing fortnightly from the winter of 1941, Hotspur from that year (44 issues) made £292 and Rover (45) made £374. 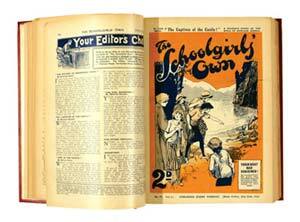 The Wizard volumes from the same era will be offered in our forthcoming March 2007 catalogue. 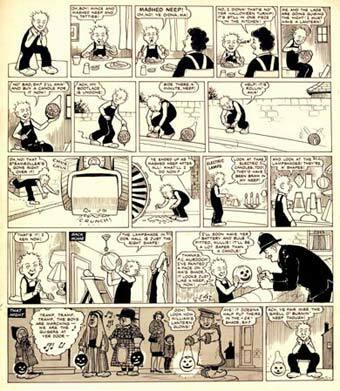 Oor Wullie's artwork had the seasonal theme of Hallowe'en. Disaster is averted as the Wee Lad's turnip lantern is crushed by a steam roller and PC Murdoch come to the rescue with lampshade, bulb and battery to outshine all his pals. 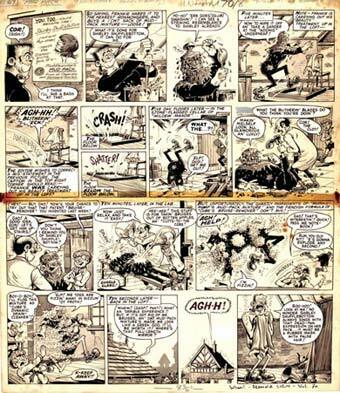 In the mid 60s "Letraset" sheets began to be used for lettering in artwork and to "shade" panels and this was utilised perfectly in the artwork's lower section. £620 was the final tender, the buyer well satisfied his top bid was not eclipsed. The Broons equine ambitions are realised as the family formally saddle up for a spot of leisurely pony trekkin'. Kitted out in their best riding gear for a local movie photographer, the stately procession is urged to have more action. The Bairn is quick to comply, setting off a wasps nest as the entourage descends into high-kicking chaos producing one of Watkin's best long panels. Unfortunately they couldnae' sit doon fir tea. £577 was tendered (behind). Frankie Stein, his artist Ken Reid and his comic, WHAM! offered an unmissable opportunity for all those fiftysomethings to bid for a piece of rare artwork mayhem. Wanting to improve his looks with Muddewump's Mud Pack, Frankie can't get it off and resorts to Professor Cube's Bruise Remover (and Professor Cube) to remove it. Not only does it remove it, but also most of his hair and all of his clothes - brilliantly plotted by Ken Reid's gifted pen. The winning bidder restored some much needed dignity with a suited and booted £550. 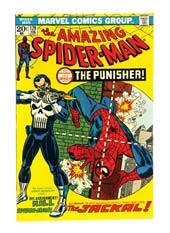 Our US section offered some high grade cents copies and Amazing Spider-Man #121, telling the story of Gwen Stacy's unfortunate demise, found £140 in nm- grade whilst The Punisher's first appearance in issue 129 reacted well to £301 in nm. These key X-Men appearances, smartened up with fresh costumes (unlike Frankie Stein), were bid to £405 each, below their estimates. Perhaps the light tanning of their pages may have slightly dulled the bidding, as well as their new kit. Talking of new kit, my mum and dad bought me an Eagle Belt in the early Fifties. It was resplendent with the Eagle buckle in grey plastic and my favourite characters from the comic printed in red around the elastic. I wore it and wore it out over the next few months and it never left the vicinity of the old wicker chair in the corner of my bedroom where my clothes were slung every night. That summer we went to Brighton on our holidays and I even had my picture taken proudly wearing it, with the sort of expression that defied even The Mekon to take it away from me. 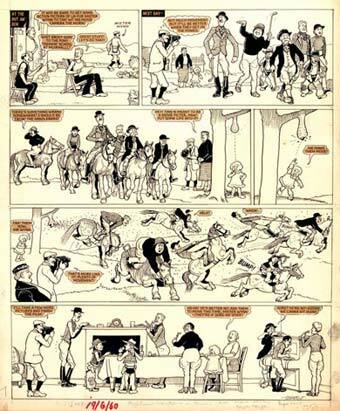 Last month the BBC were making a programme called Comics Britannia and asked me to talk about the significance of propaganda in comics during the war years, and to bring along a selection of Beano and Dandy comics and artwork from the period for filming. The crew were highly amused at the forthrightness with which Desperate Dan, Lord Snooty, Pansy Potter et al, despatched the dastardly Hun on a weekly basis only to rejoin battle once more the following week. However, that was not only what focused their attention. 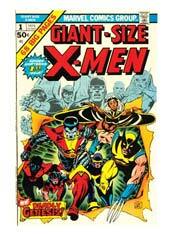 The comics used to have small illustrated ads on the text pages exhorting us all to save paper. Two in particular caught their eye; in the first Hitler and Hirohito were kneeling at the executioners block with two soldiers brandishing paper axes raised for their beheading, the slogan, "Axes For The Axis!" driving the point firmly home. 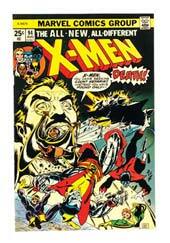 The other showed Hitler hanging dead from a rope with the legend, "Save Paper - Hang The Paper Hanger!" beneath it. Strong stuff for a nine-year-old to contemplate. With filming duly completed I was asked a week later if I had any personal photos at that age to send in as part of the programme. Fighting my way through a filthy old suitcase in the attic, I finally came across two old photos of myself as a nine-year-old and sent them in. One was of a rather smart young man posing by the beach in white plimsolls and long khaki shorts, magnificently held in place by an Eagle Belt. The other a small blurred picture of a buck-toothed grinning idiot standing in front of an off-licence. They called me back: "Malcolm, we reckon the Eagle Belt doesn't work with Beano and Dandy, so we're going with the off-licence, OK?..." Comics Britannia airs in the Spring on BBC4 and I suppose you would call that show-business.